With a much more favourable weather forecast for today I was looking forward to todays match on Longs and as I pulled into the car park it looked like there was another good turnout. One of the first people I bumped into was Ads Palmer who was back from Scotland and itching to get going as he hadn’t fished a match for ages. 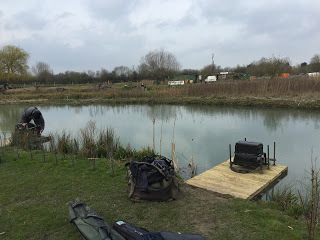 Pete announced the draw and there was the usual scrum as people delved into the bucket hoping for a flier, I pulled out a ping pong ball with the number 10 on it, not the best silvers peg on the lake but it can be okay and I have done alright off it in the past. I got to my peg and I had John Dursley on my left on peg 11 which won the silvers in the last match with 15lb and Richard S was my right hand neighbour on peg 8. I set up the same two rigs as last time, a 10 x 11 MW F1 Slim for the ten metre lines and a 0.3 gram NG XT Mini Gimp for five metres, both had size 16 Tubertini 808’s to 0.10mm. I had the usual Bait-Tech 4mm Xpands for the hook and Sticky Method Pellets for feed, I also mixed up a little groundbait. On the whistle I fed micros at ten metres to my left and straight out before cupping in a single ball of groundbait at the same distance, angled to the right and last but not least, some micros went in on the short line. I started on the middle line and was hoping for a nice early fish like last week but after ten minutes I was still waiting for my first bite! I had a look on the other two longer lines and missed a couple of bites before catching a tiny roach and this wasn’t going to plan. I wasn’t alone though as John and Richard hadn’t caught yet either and by the looks of it, Mark Leahy on peg 5 and Martin Addicott on peg 3 were really struggling as well. Martin wasn’t impressed when he drew his peg in the morning and was in two minds whether to fish or not (remember that for later!). After an hour, all I had to show for my efforts was a couple of small fish and it was fishing rock hard, Mark had resorted to fishing the whip for bits and hooked and landed a bonus tench of around a pound. I’d been dripping some micros in on the short line via a toss pot every time I shipped out but wanted to leave it for as long as possible before going over it. John had tried his short line a few times without success so I didn’t think it was worth me trying it yet. Mind you it wasn’t happening on the longer lines either. Three hours into the match I had a handful of small skimmers and roach for about a pound and I just didn’t know what to do next. Ads started getting the odd carp over on peg 34 and even Martin on his rubbish peg was getting a few as well! I lost what felt like a better skimmer and then next put in, struck at a little lift bite, only to foulhook a good skimmer that came off as I shipped back – great! With two hours left, I came in on the five metre line for the first time and had a small blade before catching three slightly better skimmers. I would like to report I bagged up on silvers for the rest of the match but the next two bites resulted in two lost carp and then I landed my first carp. I went back on the longer lines but just added a couple more small fish. John had started to get a few carp from his inside lines, Ads was still catching quite well and even Martin on his duff peg was putting a few fish together! I came back in on my shorter line for the remainder of the match and landed a couple more skimmers and two carp but it had been a real struggle. The scales started with Jason King on peg 38 and he’d done really well to catch 9lb 4oz of silvers, then Roger had a tench and a few bits for 2lb 1oz from peg 1 before Martin plonked 39lb 4oz on the scales from his ‘no-hoper’ peg, although to be fair he had done well from an area not many fancied this morning. Mark Leahy had 2lb 7oz of silvers and 11lb 5oz of carp from peg 5 and Rich had a few carp from peg 8 but didn’t bother weighing. Then it was my turn and my three accidental carp went 7lb 9oz and my silvers weighed a little more than I thought when Pete called 4lb 15oz, although I knew it wouldn’t be enough for an envelope today. 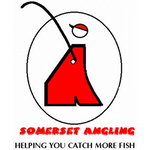 John had 20lb 10oz, Alan Jenkins didn’t weigh and Nigel Wickham went into second place with 27lb 11oz from peg 15. 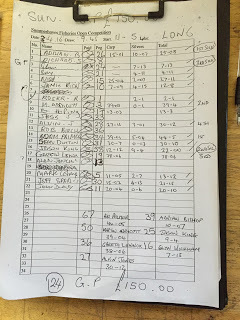 I took my kit back to the car before catching up with the scales as Pete weighed the pegs along the track, a quick look at the weigh board revealed Gareth Lennox had done well from peg 19 to go into second place with 38lb 6oz. Glynn Wickham had 7lb 13oz of silvers from peg 24, it wasn’t enough to take half of the golden peg fund but he did have a pound off me and judging by the smile on his face, that was almost as good. Adie Bishop had 10lb 7oz of silvers from peg 26 to go into the lead and I reckon he must have sold his carp rigs! 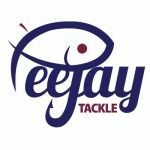 Alvin Jones had 30lb 10oz from peg 28 and Jeff Sparks fell just short of the silvers frame from peg 30 with 6lb 13oz and Sean Dutton was just 2oz behind Alvin with 30lb 10oz from peg 31. Jess Jordan didn’t weigh on peg 33 which just left Ads on peg 34 who had 39lb 1oz of carp and 5lb 4oz to push Martin into second spot. He caught on 6mm hard pellets and 6mm meat on several different lines with quite a few fish up in the water. So the weather had been nice but the fishing was hard going for some, it’s back on Longs again next week, so come back to see if I can do any better then.